Most people have misconceptions about using a less costly, more service friendly local contractor, even one who has been around for years like Creative Bath Systems. Big contractors and installers spend tons of money advertising and spreading falsehoods because they need to get so much business to reward their shareholders and make a profit. We'd like to tell you a few truths about acrylic bathtub liners and wall covers and the companies that manufacture and install them. At Creative Bath Systems we know that honesty is always the best policy. Why leave your bathroom to chance? Why have to keep replacing your liner or purchase an inferior product? With this special offer, you can have the THICKEST, best bathtub liner and wall surrounds installed in as little as a day! Yes, the "bigger" companies are factory direct, but so are we! As a matter of fact, ALL companies that buy from factories are factory direct, so don't let them fool you into thinking they are and we're not. Whether you choose a "bigger" company or a "smaller" company, you'll be FULLY protected and covered because ALL manufacturers carry lifetime warranties no matter where or who you buy them from. "They are a "bigger" company, so their products must be superior." This is NOT true! As a matter of fact, we guarantee that you won't find another company that can offer you the same acrylic bathtub liners and wall surrounds that we do because there is only ONE manufacturer that produces the THICKEST acrylic bathtub liners & wall surrounds and Creative Bath Systems carries them EXCLUSIVELY! NO, not every bathtub liner needs to be custom fitted. As a matter of fact, the MAJORITY of bathtub liners will fit directly over the pre-existing bathtub with no problems! Please note, however, that in some cases a bathtub will require a custom-fitted liner, but our team members at Creative Bath Systems are just as qualified to handle installing a custom-fitted liner as the "bigger" companies are. 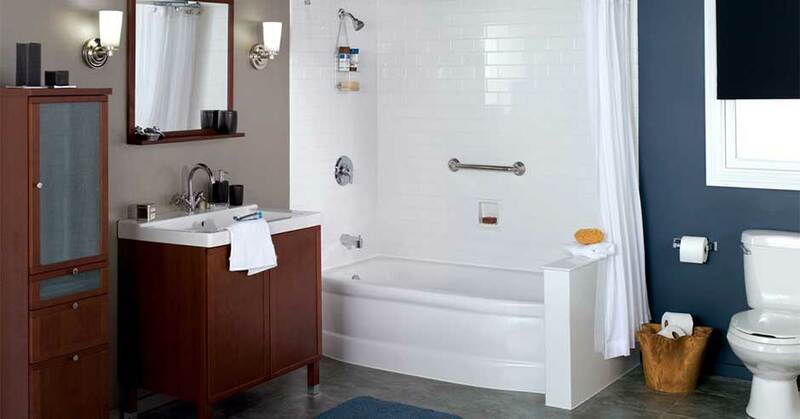 Creative Bath Systems offers you factory direct liners with lifetime warranties. We've been working in Ohio for years, we're fully insured AND licensed. Why spend more to get less when you can get a new bathroom today by building directly over top of your existing one. Imagine getting a whole new look for any bathroom in one day! Here at Creative Bath Systems, we can make this a reality. We offer the THICKEST ACRYLIC BATHTUB LINERS AVAILABLE, at the lowest possible price. Why leave your bathroom to chance? Why have to keep replacing your liner or purchase an inferior product? With this special offer, you can have the THICKEST - best bathtub liners and wall surrounds installed in as little as a day! Don't settle for less; give us a call today!